My girls are huge fans of Barbie, we've got the dolls, dvds, bags and there are many more things on their wishlist to Santa. We were very fortunate to be sent a brand new Barbie toy recently, the Chelsea Flippin Pup Pool Playset. With a RRP of £22.99, this playset comes complete with Chelsea herself and three puppies. The first thing I noticed was how colourful it was, vibrant and fun looking. It is certainly eye catching covered in bows, hearts and butterflies. The set comes with a big slide, a pool that can be filled with water and a small diving board. My girls couldn't wait to start playing. It is certainly a toy to make a splash with. Two of the dogs and Chelsea's rubber ducky ring all squirt water, making them perfect for some wet play. The girls were using them as teeny tiny water guns. 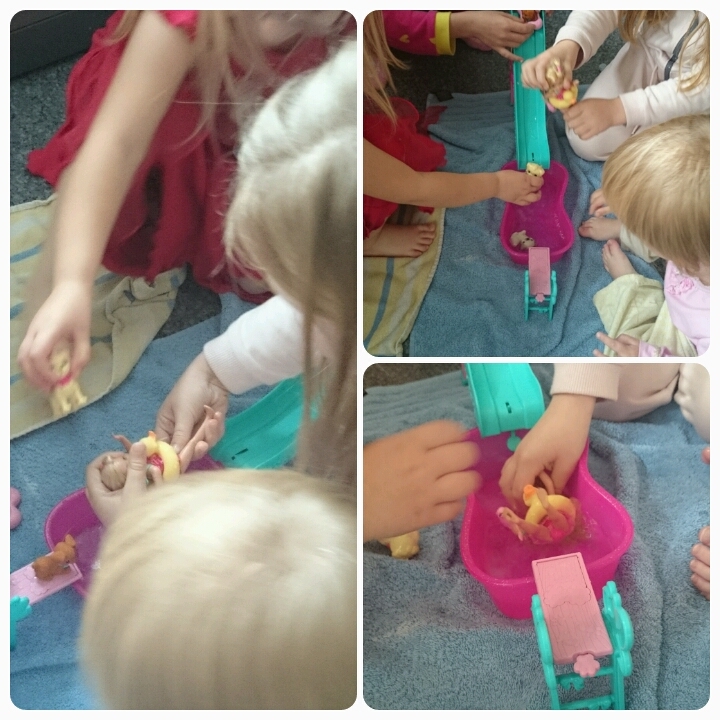 The playset could be used in the bath but we opted to pop a towel on the kitchen floor to give the girls more space. 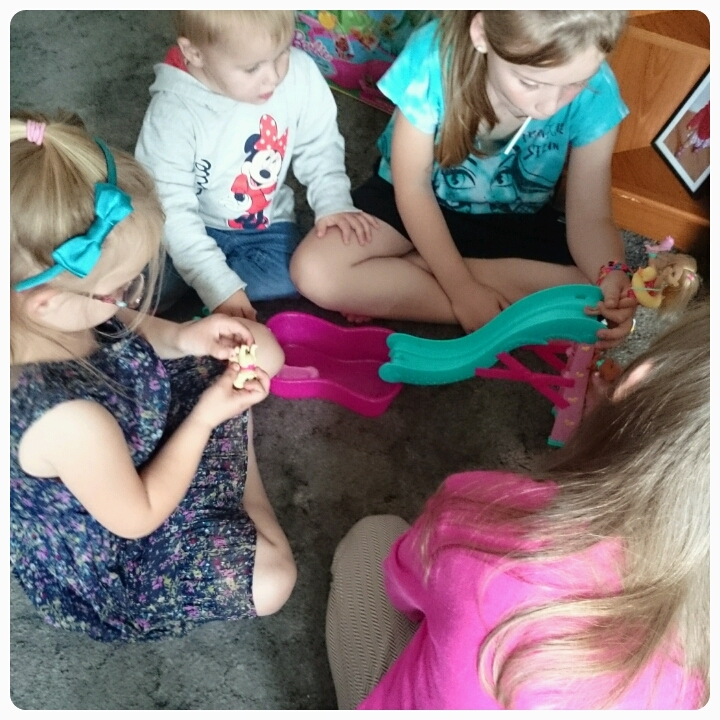 I loved how well the girls interacted together whilst playing with this playset, there were so many different things for them to do. The dogs were diving off the board and plopping in the water whilst Chelsea sunbathed beside the pool and then went for a paddle herself. There is even one dog that can go down the slide and gets itself into the water by doing a flip. You will find a catch on the bottom of the specific puppy which is released when it hits the bottom of the slide. Although the flipping part did seem to be a bit hit and miss (I think it depending on how fast the girls pushed the dog down the slide) the girls thought it was an amazing trick. There is a short video below, capturing the water fun on camera. And of course the games can continue without the pool and slide as Chelsea and the puppies can be played with separately. 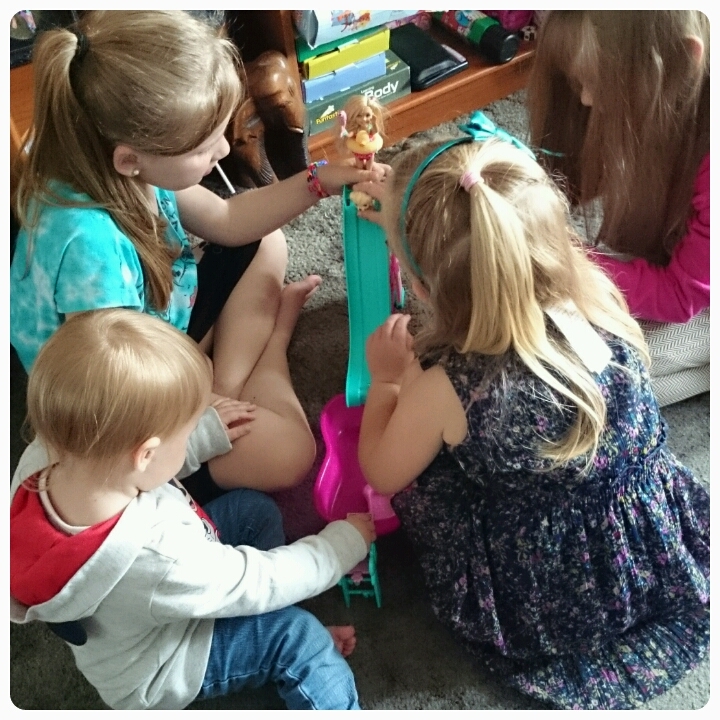 They have made friends with all of the other dolls in our house now!! My youngest has even started to take Chelsea to bed with her. Overall I think this a wonderful toy which is reasonably priced, it provides hours of fun for kids of all ages with play being made slightly different each time we got the playset out. A brilliant addition to the Barbie range of toys.